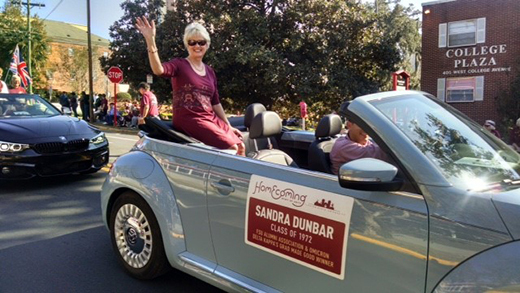 Sandra Dunbar, PhD, RN, participates in the Florida State University Homecoming Parade. Sandra Dunbar, PhD, RN, was honored with Florida State University Alumni Association’s Grads Made Good Award, an award honoring alumni who have made a significant difference through outstanding success in their chosen fields. Dunbar was recognized during the Homecoming Awards Breakfast in Tallahassee, Florida in November. The Grads Made Good Award is co-presented by the FSU Alumni Association and Omicron Delta Kappa to recognize the accomplishments of notable alumni and faculty who have secured their place in the history of Florida State University. Dunbar has dedicated her career to challenging conventional approaches and forging new frontiers in nursing knowledge to improve clinical practice and patient outcomes. She currently serves as Associate Dean of Academic Advancement at Emory University’s Nell Hodgson Woodruff School of Nursing and in many leadership positions both within the School and the broader health care community. A nationally-respected scientist and educator in cardiovascular health and disease, Dunbar is dedicated to making a difference for patients with complex cardiovascular disease through cutting-edge research, education and clinical practice. As a researcher, Dunbar has developed and tested integrated interventions that have helped both patients with heart failure and diabetes and cardiac family caregivers achieve and maintain better health through improved lifestyle choices and self-care skills. Dunbar’s research has been recognized by several leading health organizations, including the Council for the Advancement of Nursing Science, the American Heart Association and the Heart Failure Society of America. Dunbar is a trusted advisor and mentor to faculty and more than 30 PhD, post-doctoral and master’s degree candidates within Emory’s School of Nursing, and received the One in One Hundred mentor award from the Emory School of Medicine post-doctoral training program. Honored with a Distinguished Achievement award from the American Heart Association, Dunbar is also recipient of one of nursing’s highest research honor—the Outstanding Nurse Scientist Award from the Council for the Advancement of Nursing Science. Dunbar graduated with from the Florida State University College of Nursing in 1972, and since then she has made immeasurable contributions to the advancement of nursing research and clinical practice. “My education and time at Florida State University was formative in values that have supported my career and which I hold dear today – collaboration, leadership, and family,” says Dunbar.